I already discussed this in an e-mail thread with Greg and Bill, but I thought it would be relevent to reiterate here. Instapaper.com is another bookmarking site only it doesn’t look like it’s for social use (i.e. sharing with others). There are defeinitely features that are really cool though. One feature that I really like is the bookmark toolbar button. What it’s for is for users to be able to browse the internet and when they see a site that they like, they can just click on the button in their toolbar and the site will automatically be saved to their Instapaper account. How cool is that!? Needless to say I was really impressed by this. It makes saving bookmarks so much easier. I don’t even have to copy and paste the URL, give it a name or anything. It just saves right to my account and the next time I log into Instapaper, it’s there! Amazing! 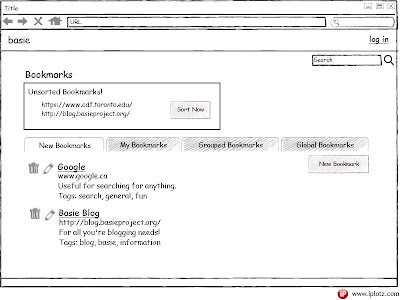 Once logged in, users can edit the link descriptions, set stars, delete, and add more bookmarks. I think that if Basie can have that kind of toolbar functionality, students will be more likely to use it. The toolbar button could automatically save the page into the user’s project/group and allow access by other members of the project. 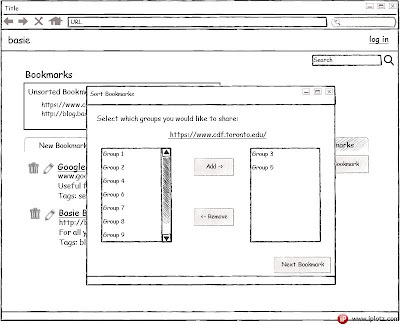 If a user is in multiple projects/groups, then it should be saved in an “unsorted bookmarks” section, where the next time the user logs in to view their bookmarks, they will be prompted to set a group for those bookmarks. Or, those unsorted bookmarks will be highlighted at the top of all the bookmarks to draw attention to them to let the user know that they are currently unsorted. Once a bookmark is sorted into a project/group it can then be edited and viewed by other members of the group. Here are preliminary screens of unsorted bookmarks and sorting them. Notice that in the second image, Groups 3 and 5 have been added and the button on the bottom says Next Bookmark. If there are no more bookmarks, then the button should say Done. This way of bookmarking assumes that nobody would bookmark pages for personal use and so every bookmark SHOULD belong to at least one group. I think that it makes sense to make all bookmarks and pages accessibly to at least one group because if a user wanted a bookmark for personal use, it’s more likely that they would use a thirdparty site or just save it in their own browser. Please feel free to comment on this and whether there are preferences that perhaps I’m overlooking. Thanks! This entry was posted on Tuesday, March 31st, 2009 at 8:42 pm and is filed under Uncategorized. You can follow any responses to this entry through the RSS 2.0 feed. You can leave a response, or trackback from your own site.